Tidewater Community College President Edna V. Baehre-Kolovani tweeted on stage. Four siblings graduated on the same day. 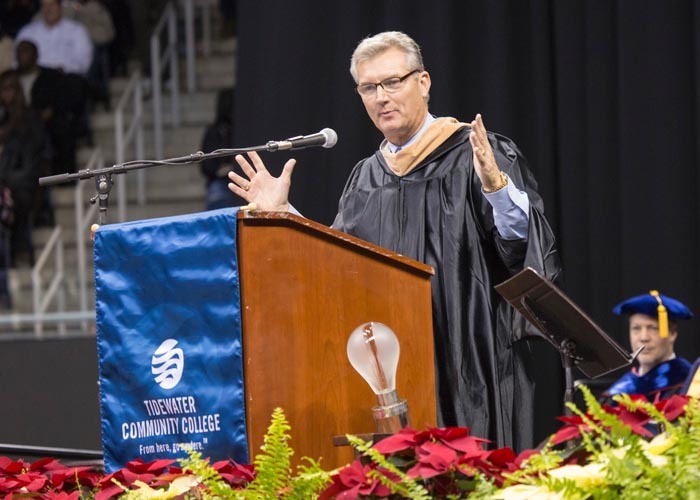 And Virginia Secretary of Transportation Aubrey Layne reminded TCC’s newest alumni that the American dream is very much alive and in their control. 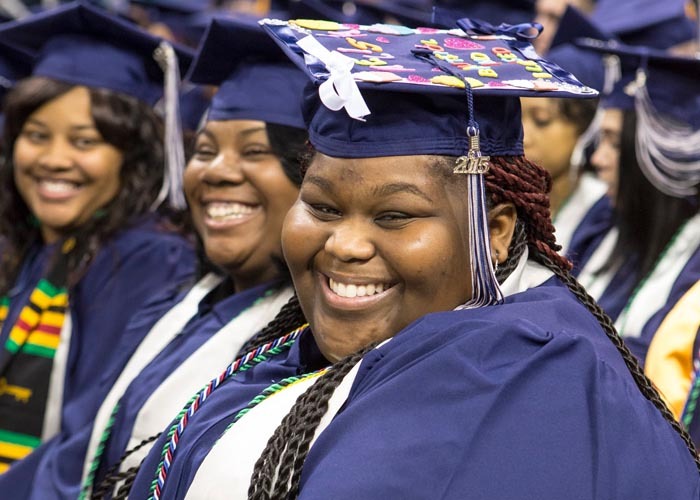 All were part of the college’s 61st commencement exercises, held Dec. 19 at the Ted Constant Convocation Center. The ceremony featured a couple of firsts, including Baehre-Kolovani live tweeting about the festivities and encouraging the audience to do the same. Kolovani also acknowledged four siblings, ranging in age from 29 to 35, graduating together, a rare occurrence and also a first for the 23 colleges that make up the Virginia Community College System. David, Michael, Daniel and Michelle Guzman followed the path of their mother, Geri Guzman, who earned her associate degree from TCC in May 2014. One more Guzman sibling will graduate this spring. “Now that’s a dedicated TCC family,” said Kolovani, who met with the family prior to the ceremony. Layne stressed the significance of education, urged the graduates to embrace problem solving and reminded them to have a personal vision. Student speaker Justin Ross, who earned his Associate of Science in General Studies, stressed the importance of giving back to others. “I challenge each of us here today to make a difference, not only in our own lives, but in the daily lives of our friends, neighbors and fellow human beings,” he said. James Jackson Sr. of Chesapeake and Thomas Moss Jr., both of whom died earlier this year, were recognized in the ceremony. Jackson served on the TCC College Board, and Moss was instrumental in the development of TCC’s Norfolk Campus, named in his honor. Kolovani also acknowledged Helena Krohn, Professor Emeritus, who died unexpectedly in December. The history professor joined the TCC faculty in 1972. Prior to the awarding of student degrees and certificates, James Spore, manager of the City of Virginia Beach, received an honorary associate degree. Spore is retiring after 24 years as city manager at the end of the year. Lisa Rhine, provost of the Chesapeake Campus, also awarded a posthumous degree to Jacqueline Brunberg. The Chesapeake resident, who earned her Associate of Applied Science in Interior Design, died in June. Numerous family members were in attendance. 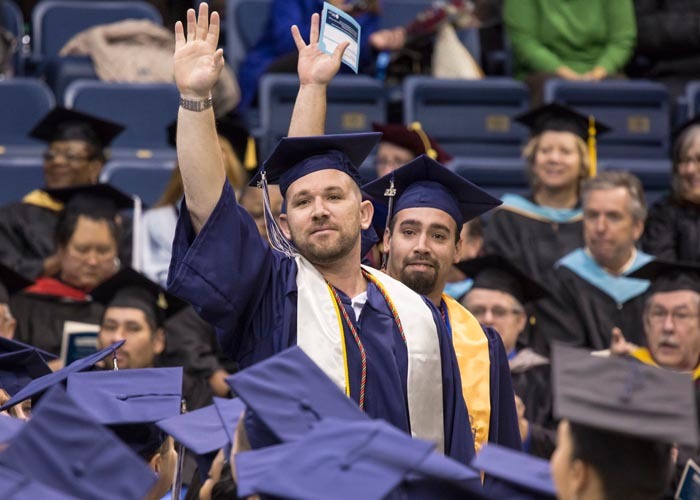 More than 2,100 students earned certificates or associate degrees in fall 2015, becoming the newest TCC Alumni members.